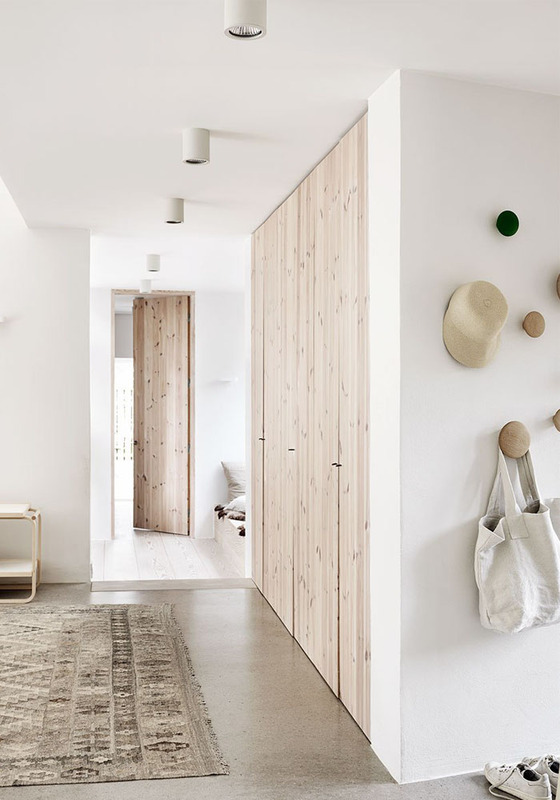 I love a beautiful Scandinavian home and natural wood + white walls is a combo that I find increasingly soothing and attractive. Maybe it is the fact that I spend more time out of the city, surrounded by nature and truth to be told, the first thing I do now in the morning, is (still wearing my PJs) putting my gumboots on to feed our chickens. Maybe, it is the fact that we live 20 minutes from the beach, surf twice a week and get a massive salty injection from the Atlantic Ocean and all its raw, wild beauty. 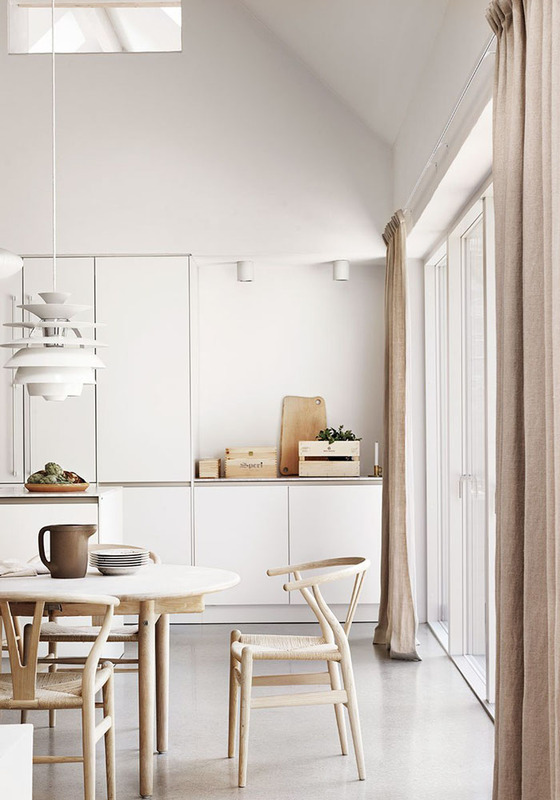 With its high ceilings, white walls, pale wood and natural textured accents, this home exudes all these things that one can imagine in a home by the beach, don’t you think? 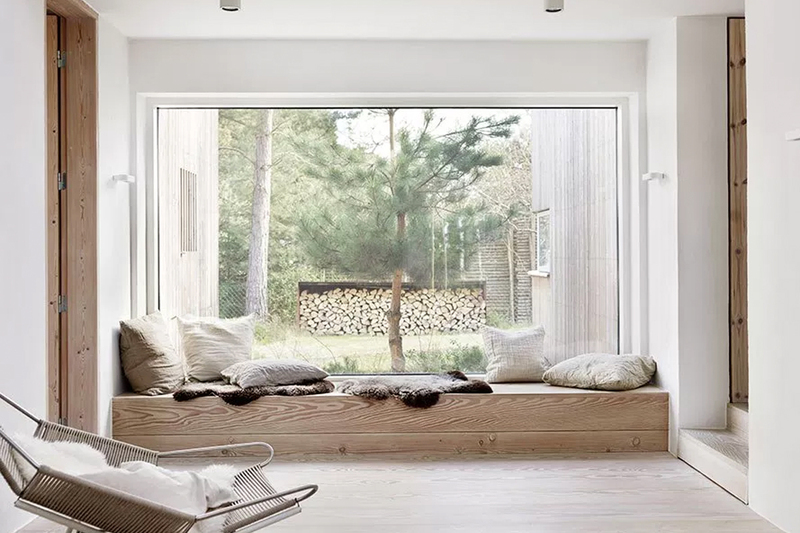 Located in the south of Sweden, near Malmö (a city I only know from the extremely brilliant crime series The Bridge), this home combines tranquillity, modernity and embodies a very soothing, welcoming feel. A long wooden bench with comfy linen cushions provides the perfect spot to read and e inspired by nature. Don’t you love houses filled with natural light and big windows where you can admire the change of seasons from the warmth and comfort of your home!? In London, where it gets pitch black by 4pm in wintertime, it should be compulsory to have large windows like the Dutch do and it is why we installed this large window in our kitchen when we renovated our home. For those considering renovating their homes, it is a structural change that I highly recommend. 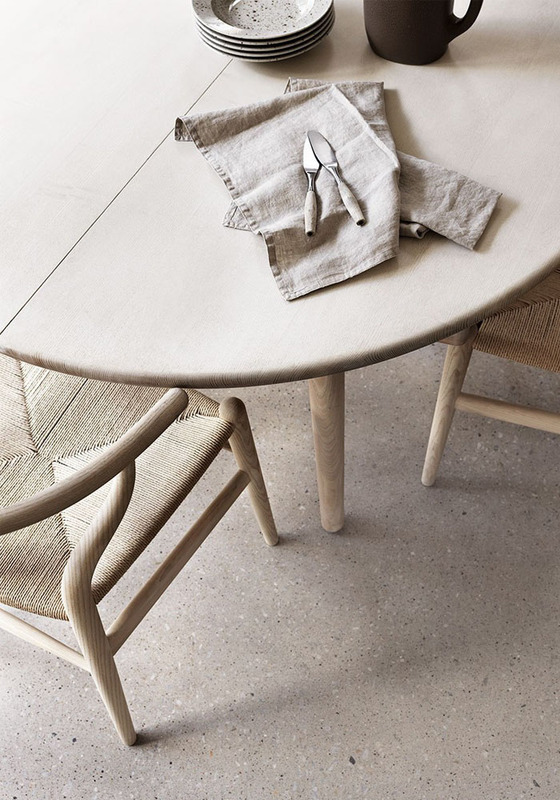 Attention to details, classic designs from Hans Wegner with the PH Snowball pendant light or the CH-24 wishbone chair , Muuto and minimalist design is what this house is about. I’m also fond of the look of the bathroom and this large window. It is a look, Steve and I we love to achieve in our home in France where the bathroom needs to be renovated but I need to sort out the privacy issue as our bathroom overlooks the back garden where entertaining occurs in Summertime. What do you think of this home? Do you like it? the house is beautiful, karine! 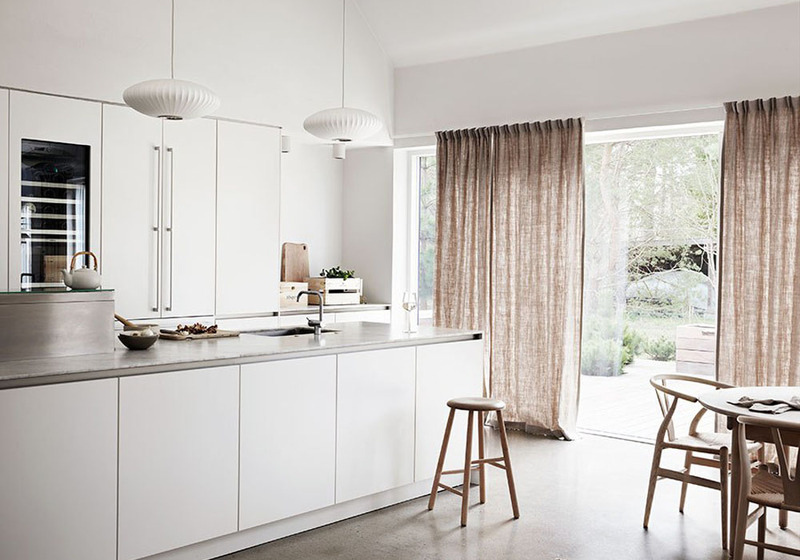 – i really like the lots of light and light colours and natural materials!!!! Great!!! I love the scandinavian naked snowy look! I am however buying a house with black sparkling stone floors, any proposal on how to get a light look despite the dark floor? It’s a beautiful house. All the pictures are very lovely. Thanks for sharing this post. Big windows and natural light bring you so close to the seasons, you’re right. 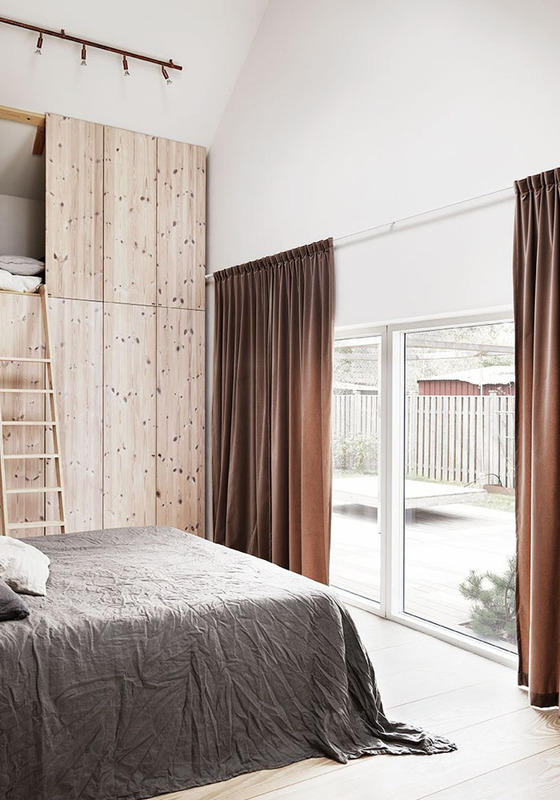 Too often Scandinavian styles are used in bedrooms and photographed with the curtains closed and all the lights on; this just isn’t how it’s meant to be. 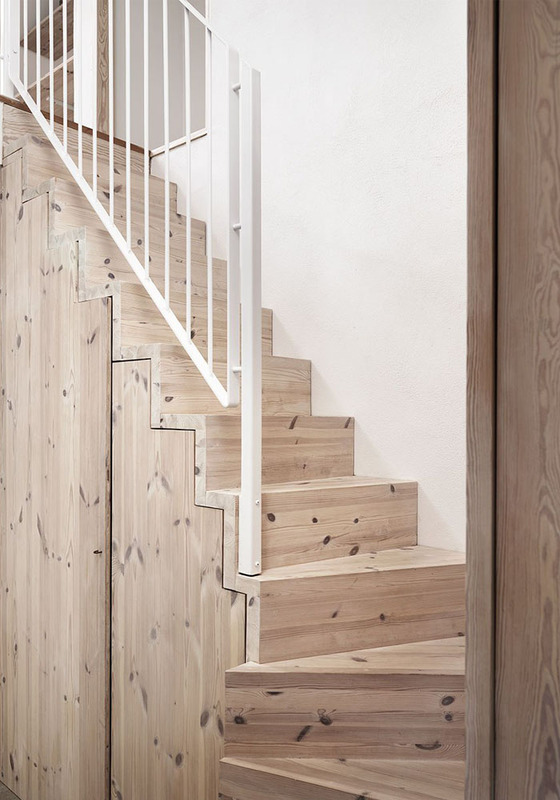 The use of light woods should be immediately reflected in the trees outside, crisp whites reflected in glass. This example is a particularly rustic one; the doors are just stunning and the material of the curtains is incredibly brave yet it ties together with a commitment to this natural, chilled out lifestyle. Great post !!! good- looking house. All the pictures are very impressive . Thanks for sharing this post. this is house is amazing, the window seat, but the floor! wow the terrazzo is amazing! the color and everything! Yes it’s very nicely done! The floors in the livingarea looks like polished concrete which is very popular here in Scandinavia in modern newbuilds. Also used in custommade counter tips. The living room with the fireplace looks cozy and welcoming, you can feel the warmth of the fireplace. Like the long wooden bench with the furry throw.